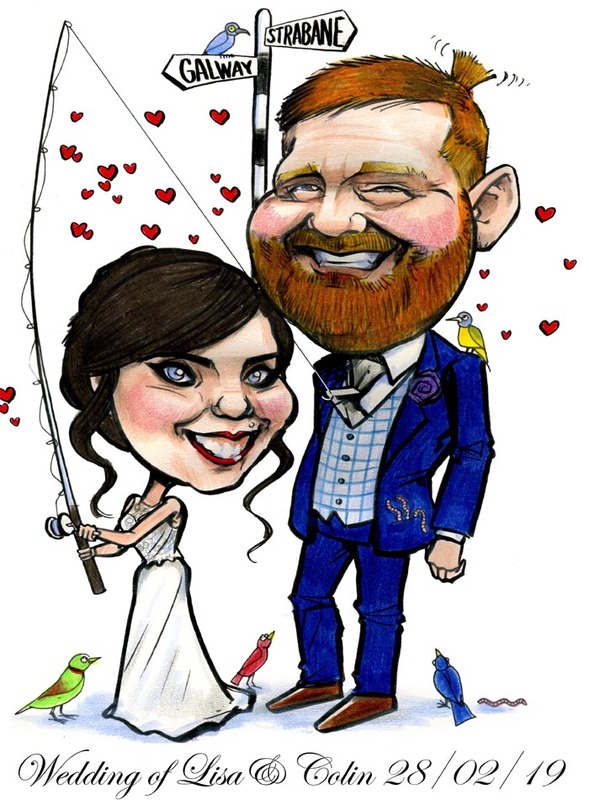 Fishing Theme Wedding Present Ireland – Caricature Signing Board! Fishing Theme Wedding Present Ireland: this wedding caricature signing board was actually a wedding present for my friends! I thought the groom’s interest in fishing served as quite a good visual metaphor for their nuptials! It was lovely being a guest for once (in the Hotel Doolin), although I kept going for the coffee during the drinks reception and had to be reminded I was off duty (I usually get highly caffeinated for my live wedding carictures!) Of course my wedding signing boards are highly customisable so whatever interests the couple has can be incorporated into the design. If you’re interested in a wedding signing board for a fishing theme wedding present or any other theme, why not drop me a line! A very popular theme is the GAA, and you can see my GAA-theme wedding boards here. Charlie Adley’s Double Vision – Your Mission: Find the Nun with the Scythe! Star Trek Theme Wedding Present!